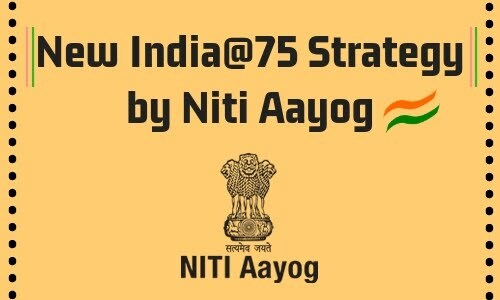 NITI Aayog unveiled comprehensive strategy for New India @ 75 which defines clear objectives for 2022-23. It is a detailed document which discusses forty-one crucial areas, that recognizes the progress already made, identifies binding constraints, and suggests the way forward for achieving the clearly stated objectives. The strategy will encourage discussion and debate and will invite feedback for further refining policy approach. Over 800 stakeholders from within the government – central, state and district levels and about 550 external experts were consulted during the preparation of this document. The forty-one chapters in the document disaggregated under four sections: Drivers, Infrastructure, Inclusion and Governance. It focuses on the engines of economic performance with chapters on growth and employment, doubling of farmers’ incomes, upgrading the science & technology and innovation eco-system, and promoting sunrise sectors like fintech and tourism. Accelerate the economy to achieve GDP growth rate of about 8% on average during 2018-23 which will increase the economy’s size in real terms from USD 2.7trillion in 2017-18 to nearly USD 4 trillion by 2022-23 and will also increase the investment rate as measured by gross fixed capital formation (GFCF) from present 29% to 36% of GDP by 2022. In agriculture, shift the emphasis to converting farmers to ‘agripreneurs’ by expanding e-National Agriculture Markets and replacing the Agricultural Produce Marketing Committee (APMC) Act with the Agricultural Produce and Livestock Marketing Act. Give a strong push to ‘Zero Budget Natural Farming (ZBNF)’ which reduces cost, improve land quality and increase farmers’ incomes. To ensure maximum employment creation, the complete codification of labour laws and massive effort must be made to upscale and expand apprenticeships. A mission should be launched named “Explore in India” by revamping minerals exploration and licensing policy. It deals with the physical foundations of growth which are crucial in enhancing the competitiveness of Indian business ensuring the citizens’ ease of living. Expedite the establishment of the Rail Development Authority (RDA) which will advise and make informed decisions on an integrated, transparent and dynamic pricing mechanism for the railways. The share of freight transported by coastal shipping and inland waterways should be doubled. Initial viability gap funding (VGP) will be provided until the infrastructure is fully developed. An IT-enabled platform should be developed for integrating different modes of transport and promoting multi-modal and digitized mobility. With the completion of the Bharat Net programme in 2019, all 2.5 lakh gram panchayats will be digitally connected which aims to deliver all government services at the state, district, and gram panchayat level digitally by 2022-23. It deals with the urgent task of investing in the capabilities of all of India’s citizens. The three themes in this section revolve around the dimensions of health, education and mainstreaming of traditionally marginalized sections of the population. Successful implementation of the Ayushman Bharat programme (ABHP) including the establishment of 150,000 health and wellness centres across the country, and rolling out the Pradhan Mantri Jan Arogya Abhiyaan (PM-JAY). A focal point should be created for public health at the central level with state counterparts. The quality of the school education system and skills should be upgraded, including the creation of a new innovation ecosystem at the ground level by establishing at least 10,000 Atal Tinkering Labs by 2020. A huge push should be given to affordable housing in urban areas to improve workers’ living conditions and ensure equity while providing a strong impetus to economic growth. Conceptualizing an electronic national educational registry for tracking each child’s learning outcomes. It delves deep into how the governance structures can be streamlined and processes can be optimized to achieve better developmental outcomes. Implement the recommendations of the Second Administrative Reforms Commission (ARC) as a prelude to appointing a successor for designing reforms in the changing context of emerging technologies and the growing complexity of the economy. Setting up a new autonomous body named the Arbitration Council of India to grade arbitral institutions and accredit arbitrators to make the arbitration process cost-effective and speedy, and to pre-empt the need for court intervention. The issue of backlog of pending cases should be addressed by shifting part of the workload out of regular court system. Expanding the scope of Swachh Bharat Mission (SBM) to cover initiatives for landfills, plastic waste and municipal waste and generating wealth from waste.